The cast of one of this year’s surprise hits, Dear White People, reunited for the video “Get Your Life” by Caught a Ghost from the Dear White People soundtrack. 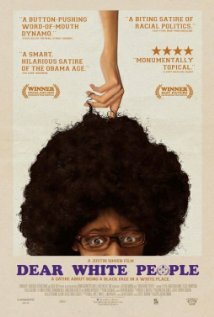 The video features stars of the film and is directed by DWP director Justin Simien. One of the other things this videos features is singing from Tessa Thompson. Not only does Thompson intro the video, you can hear her sultry voice at 2:16 mark. I wasn’t sure if that was her actually singing so did what any normal person does in 2015, I sent her a tweet. Looks like Tessa and Nolan make a pretty good musical tandem. I’m looking forward to hearing more music form them to seeing Tessa’s performance in Selma later this year. Check out the video for Get Your Life below. Posted in Clips and tagged Dear White People, Get Your Life, Justin Simien, Selma, soundtrack, Tessa Thompson, Twitter, video. Bookmark the permalink.